Board of Missions of the Methodist Episcopal Church , “Mission Photograph Album – Portraits #07 Page 0087,” UMC Digital Galleries, accessed November 27, 2018, http://catalog.gcah.org/omeka/items/show/60699. Lawson was born in Uniontown, Pennsylvania, in 1928, one of nine children of a U.S. Methodist pastor and a Jamaican mother. He took much of his attitude toward others from his mother, who did not believe in violence. Lawson grew up in Massillon, Ohio, where he became a good student in predominantly white schools. He entered Methodist-related Baldwin-Wallace College in Berea, Ohio, where he joined the Fellowship of Reconciliation (FOR) and became interested in the nonviolent methods of Mahatma Gandhi. He must A. J. Muste, the executive secretary of FOR, and others in the pacifist movement, including James Farmer, Bayard Rustin, and Glenn Smiley. Although he initially registered for the draft, he became a conscientious objector at the time of the Korean War and was sentenced to three years in federal prison. Baldwin-Wallace refused to grant his degree because of his prison sentence. Entering prison in April 1951, he served until May 1952, when he was paroled. He returned to college to obtain his degree, then became a short-term missionary of The Methodist Church to Nagpur, India, where he was an instructor at a Presbyterian school, Hislop College. Lawson was surprised to find that some Western missionaries did not like Gandhi and considered him a troublemaker. But Lawson considered that Gandhi had exemplified Jesus’ teaching of love. Lawson returned to the U.S. in 1956, did postgraduate work at the Oberlin Graduate School, and also received a degree from Boston University. He met Martin Luther King, Jr., who urged him to find a way to serve in the South. Lawson accepted an invitation from FOR to develop nonviolent methods for African-American students in Nashville, Tennessee. In the fall of 1959, he began voluntary training workshops for college students there, and shortly after the Greensboro sit-ins, Nashville students started sit-ins on February 13, 1960. 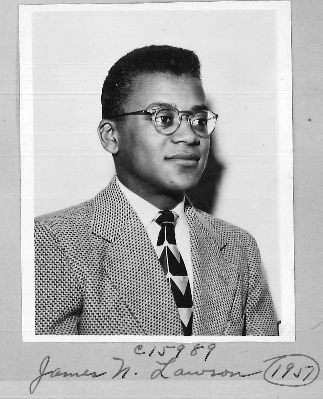 In the ensuing months, students continued to protest, and the lunch counters were desegregated, but not before Lawson was expelled from Vanderbilt and jailed. Lawson participated with King and others in the civil rights protests throughout the 1960s. He was a founding member of Black Methodists for Church Renewal in 1968. In 1974, he was appointed pastor of Holman United Methodist Church in Los Angeles, where he served for many years. He served the denomination as a member of its agencies and continued to articulate concerns for justice in the U.S. and peace abroad. In October 1996, he received the distinguished alumnus award from Vanderbilt University, despite never having received a degree there. Taken from Linda Gesling, Mirror and Beacon: The History of Mission of The Methodist Church, 1939-1968. (New York: General Board of Global Ministries, The United Methodist Church, 2005), p. 206.